I’m pretty sure this makes me a terrible cynic, but most “hopeful” music makes me want to jump off a tall building in utter despair. There are few hopeful, optimistic songs that don’t sound to me like crass, overreaching, empty gestures, and even fewer bands or artists capable of consistently making uplifting but still emotionally authentic, truthful music. In fact, I can immediately think of only two such artists that I listen to on a regular basis — Sigur Ros (whose albums and live performances inspire true reverence among their devoted following) and now, with the release of the magnificent Hurry Up, We’re Dreaming, M83. 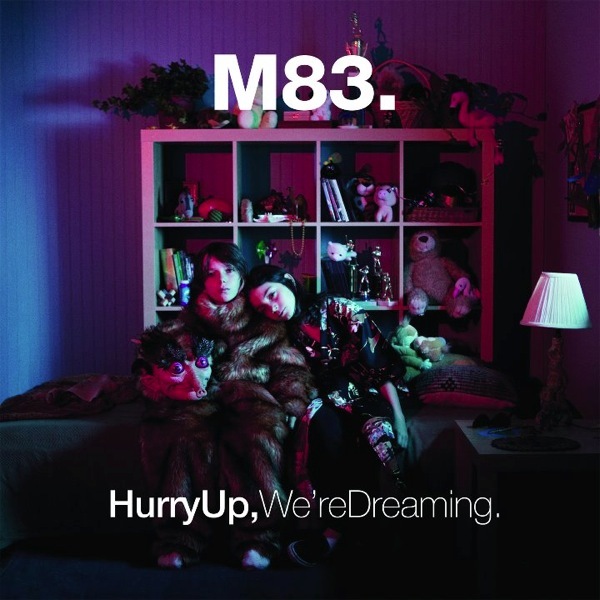 With constant spinning over the last few days of Hurry Up, We’re Dreaming, M83’s finest album by a chasm, it occurs to me that M83 shares with Sigur Ros an important core trait. Neither seems all that interested in what might be called “musical realism” in their recordings. In other words, as technologically manipulated as most modern recordings are, they still sound at least somewhat like “a record of an event, the event of people playing music in a room,” as Ani Difranco once sang. Not so, it could be argued, with Sigur Ros and M83, whose recorded music sounds super-human, or extra-human, like a beckoning signal from a realm much more vast, unknowable, and intangible than our own, an “unreal” realm they have created through their singular vision. To differentiate Hurry Up, We’re Dreaming from the occasionally sparse, methodical output of Sigur Ros, I find much of the new M83 album to be the most insistently luxurious music I’ve heard in quite some time. For evidence, turn to the soon-to-be-iconic synth/voice yelps and buttery saxophone solo that bookend the album’s startlingly moving lead single, “Midnight City.” Or how about the layer upon pillowy layer of Anthony Gonzales’ suddenly way-out-front vocals on more than half the album. Or the synthetic-bass-driven, chopped-up, unapologetic cheese-funk of “Claudia Lewis,” the end of which could soundtrack the cutting room floor bits of Beverly Hills Cop (and I mean that as a compliment). Or hell, how about every devastating, crescendoing second of “Steve McQueen” and the aptly named “This Bright Flash.” It’s all gloriously indulgent and sugary, squarely aimed at your deepest pleasure centers, and it has nothing to do with “real life” whatsoever. And yet, for all its super-human unrealism, this album is never distant or remote from the listener. Quite the opposite—Hurry Up, We’re Dreaming (note the inclusive first-person plural in the title) reaches out to us and welcomes us to join in its wide-eyed yearning. It begs us to abandon gray realism for one damn minute and lose ourselves, to be overwhelmed, to fly like the winged, to dream like the young, to hope without fear of the dashing. Best of all, this transformative art practically demands that we strive to see our “real” worlds through new, less weary eyes. That is the mark of music that actually deserves the adjective “hopeful”—creating a dream world and transporting you there so thoroughly that, even if only temporarily, you feel real hope for something better and greater when you come back.